Now that warmer weather is finally here, many couples are putting the finishing touches on their spring wedding planning. This season has become particularly popular over time because spring lends beautiful weather and flowers are beginning to bloom. However, there are some problems that can arise. Here are some considerations you should take into account when preparing for your spring wedding. In Oklahoma, the weather can change without warning from sunny to severe. This can be very discouraging when your wedding has been planned outdoors. In the event you face a rain-out, it is important to have a backup plan to ensure things go off without a hitch. 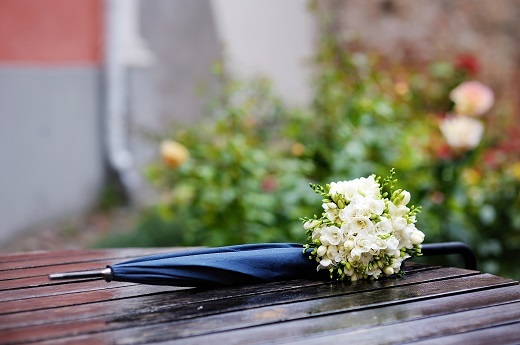 Depending on wind conditions, light rain may not be all that bad for your spring wedding. For instance, imagine the pitter-patter of rain falling on a protective covering while celebrating such a great occasion. Manageable weather can provide a dramatic boost in atmosphere that some couples may be appreciative of. Depending on the time of day your wedding is held, the increased sunlight experienced during spring can cause a wide variety of problems. Planning the timing of your spring wedding with the movement of the sun is often overlooked, unfortunately. No one wants to be squinting in every wedding picture that is taken throughout the day. Unfortunately, squinting in pictures is probably the least of your worries when dealing with intense sunlight. This unfortunate situation can also lead to washed out pictures taken by your wedding photographer. Memories should be cherished but that can be hard to do when they don’t accurately represent your special day. Every wedding is different and many different considerations can come up for different individuals. What special circumstances or problems can you foresee for a spring wedding that may have been overlooked?